Mike Eaves is a photography enthusiast from the USA. In this issue he tells us why he likes macro photography so much. Matt Grayson looks at two new digital camera offerings from Pentax and puts them to the test. Andrew Cowin takes the ordinary and turns it into something extraordinary. Matt Schofield loves HDR, here he tells us how he uses the technique to enhance his photos. We decided to shine a light on our members and this issue, we start with Graham Hutton. In part one of this new series, John Riley gets our digital files in order. 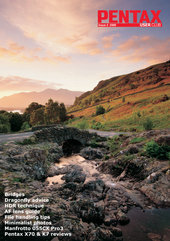 Craig Roberts guides us over a few bridges to show us how to photograph these wonderful structures. Matt Grayson sees if the Manfrotto 055CX Pro 3 tripod is good enough for a Pentax camera. John Riley takes us to the AF revolution and looks at the backward compatibility of the KAF mount. Matt Grayson inspects the latest digital SLR offering from Pentax â€“ the K-7. See your images in print, and win a prize! you’ll learn key techniques to enhance your own portrait work. feature, where photos can be set for automatic entry to the magazine competition.